The Student Ministry is for teenagers in 7th -12th grade. Our environment is fun, interactive, (sometimes loud) & friendly! It’s a welcoming place where they can feel right at home. We provide live music on Sunday's just for students along with great Biblical teaching. We teach students what it means to love God, love others, how to serve one another, and impact those around us in our communities. Our motto for Students @ the Heights is "Doing Life Together" and we believe in that! Its a journey that we're so excited to be a part of! We have a full cafe offering all different kinds of drinks or smoothie's along with various snacks. So invite a friend and come join us in the fun! For the past couple of years, Students @ The Heights has travelled to California, to Hume Lake, for an amazing summer camp experience. This year for camp, both Jr High and High School will be attending the same week! In addition to registrations being full, our waiting list is considerably long at this time, so we have removed the registration link at this time. If you have questions, please contact Pastor Matt Stude directly. You can email him at . However, we encourage you to still register. We'll add your camper to our waiting list, and if/when we receive more available spots from Hume Lake we'll add those who are on the waiting list, in the order in which they were received. "What is Skittles Bowling?" you may ask… Well its bowling, with a twist! You'll just have to be there to find out. 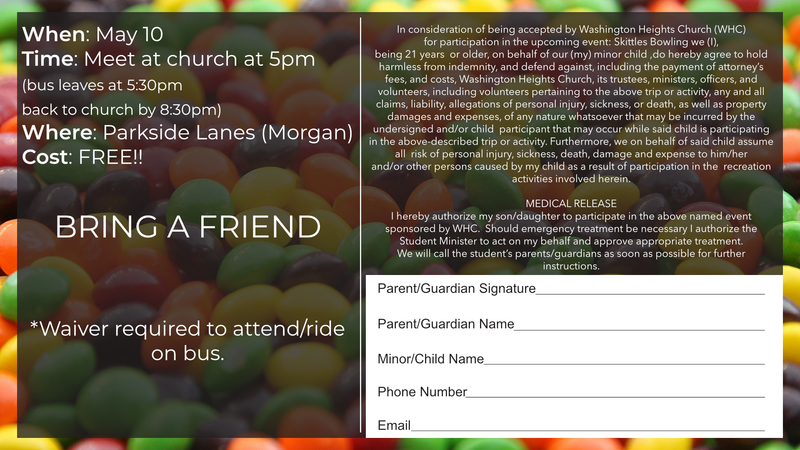 Meet us at Washington Heights Church on May 10, we'll take a bus out to Parkside Lanes in Morgan for some bowling fun! When/Time: May 10 - Meet at church at 5pm, return to church by 8:30. Cost is FREE, so BRING A FRIEND! !